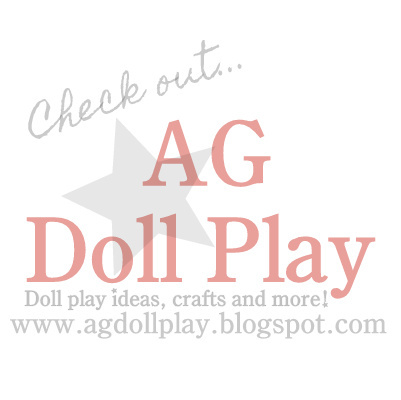 American Girl Doll Play: Doll Crafting: Make a Doll Salon for Your Dolls! Doll Crafting: Make a Doll Salon for Your Dolls! It's been awhile since we last created a fun backdrop for the dolls so it was time that we put our thinking caps on to figure out what our next one should be. Zoey suggested a doll salon and since she already has lots of salon accessories I agreed that it was indeed a good idea and we did it! As with all my other backdrops, I used a foam core board that I found at our local dollar store and adhered patterned papers to it to create the look of paint or wallpaper. I used strips of cut white paper for a border and to mat the "mirror" which was just mirror card paper that I found at our local scrapbook store. The stars were puffy stickers that I had also found there. That's it for the construction of the play piece itself...now on to the play! Emily came in and needed a deep conditioning treatment as well as some straightening, (she needs to do that once in awhile with the humidity). Elizabeth took one look at Emily's hair and got busy...first she made sure she was comfortable in her smock so she wouldn't get her pretty outfit all dirty. And then she led Emily to her chair...she was lucky to get in right away with no appointment, especially since it was the weekend and Mother's Day! She offered Emily a favorite magazine to read, of course she chose the latest issue of the American Girl Magazine! After the conditioning treatment Elizabeth got busy straightening Emily's hair. It's a long process since Emily really has thick and beautiful hair. Once done, Elizabeth got the hand mirror for Emily so that she could see if she was happy with the new and healthier look. Emily loves it and is so happy! She will be coming back to this salon for sure! Here are some close-ups of Zoey's new doll salon. The rolling cart with drawers along with some of the salon tools are from the brand My Generation and it's awesome! It comes with so much and has lots of play value in our opinion. We love the curling iron and flat iron perhaps the most. Then we have the blue hair salon styling caddy that came with lots of hair accessories Zoey got this from her Grandma for a birthday and it's been great for storage of all those little things and now it goes great with our salon as well! Here is a final shot of our salon...doesn't it look like a real hair salon? The mirror looks a bit funky since I had to use two mirror papers (you can see our wreath hanging in the background) but for the dolls it works just great! We hope we've left you inspired to get busy and create for your dolls today! Thanks for stopping by! Beautiful backdrop and cute photo story too! A fun project might be to have Zoey create a book of hairstyles for the 'girls' coming to the salon to look at! She could either 'do' the dolls hair then photograph them, or cut apart an American Girl catalog then glue them into a small book. Cute Salon! Thanks Amanda, that's a great idea! It would be fun to do up all the different hairstyles. We should have a girl and doll spa party soon! Thanks so much for your support Chrissy! So happy to have you here! Adorable! What did you use for the chair rail? Great job, the whole scene looks great! I was curious about the chair rail too! Thanks and love the blog! I just found your blog - it is great! Thank you for all the fun ideas. I was wondering if you could tell me what the width and height of your foam core backgrounds are. Thanks! I like the all the pictures. The best hair style is really helpful for getting the new look and if you love to try different different look then Hair Studio is really good for you.